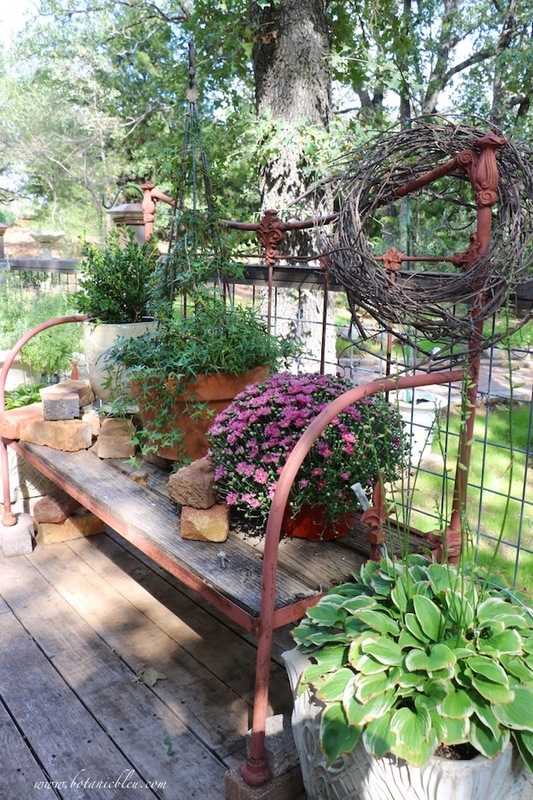 Before you see the French Country garden bench decked out for Fall, let me tell you about finding and buying the repurposed bed-into-bench. When I was drawing house plans on graph paper dreaming of building a post and beam country house, I also was collecting special things to include in the house. Blue sink, old brass front door handle, antique Chicago bricks, . . .
And looking for antique furniture. Each week I would read the classified ads in the newspaper (before Craigslist . . . remember), and search out possible garage sales, estate sales, and antique stores to visit. On Saturdays, I would head out to track down the leads. But the summers were the best! Since I was a teacher I had the summers free. In the summers, I could go any day of the week to find those special items destined to go into our dream post-and-beam home. In my research, I discovered Forney, Texas was home to several large antique stores/barns, reportedly with good prices. Forney is about 45 miles from Arlington where I lived. Even though I was young, I was still cautious and did not want to drive there by myself. With my best friend, who was also a teacher, we set off one sunny summer week day to Forney driving my husband's truck. We knew we were going to find things to buy and knew we needed the pick-up truck to get our treasures home. Forney was a gold mine of antique stores along the interstate highway. 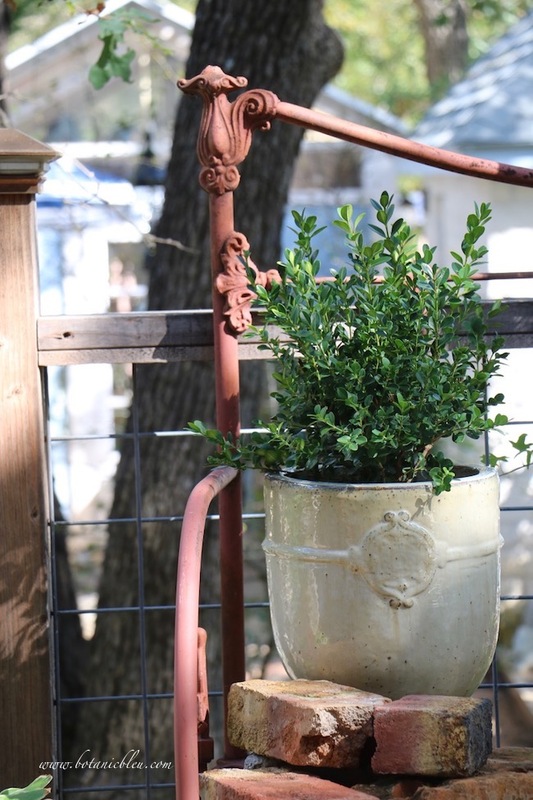 I bought a weathered pine washstand to hold a sink in the new guest half-bathroom-to-be, a mellow, weathered pine mirror to hang above the sink, a pine armoire for my planned office loft, and the vintage iron bed-to-bench that is now my garden bench. The weathered pine washstand is still in the guest bathroom, but the weathered pine mirror was replaced when I updated the half bath with new French style. Between my friend's purchases and my purchases, we had to use both my knowledge of spatial relationships (geometry teacher, here) and the dealers' muscles to carefully fit everything into the bed of the small pick-up truck for the journey home. A few weeks after we made our trip for antiques in Forney, the huge barn where I bought most of my finds burned to the ground. Such a sad day for the owner, for all of his customers, and for the loss of all those antiques. We were so happy we had made the trip and had given new homes to a pick-up load of antiques. 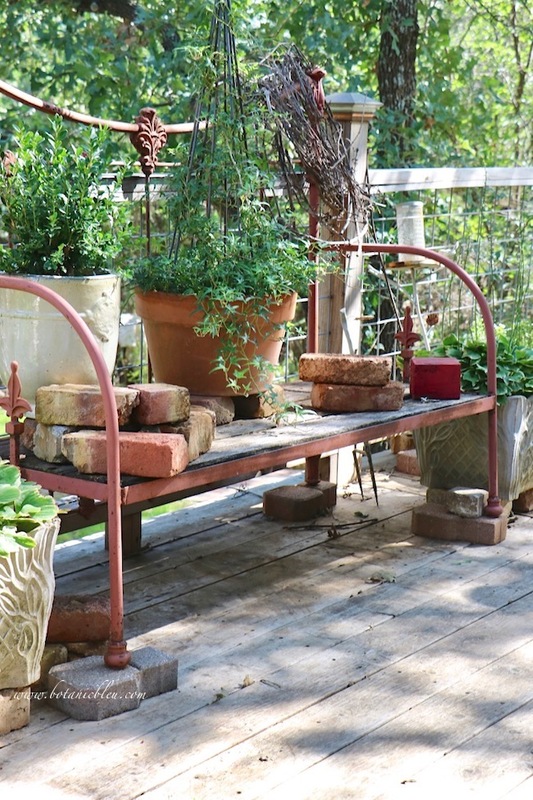 Over 31 years later, the repurposed bed-to-bench is still a part of my country home. 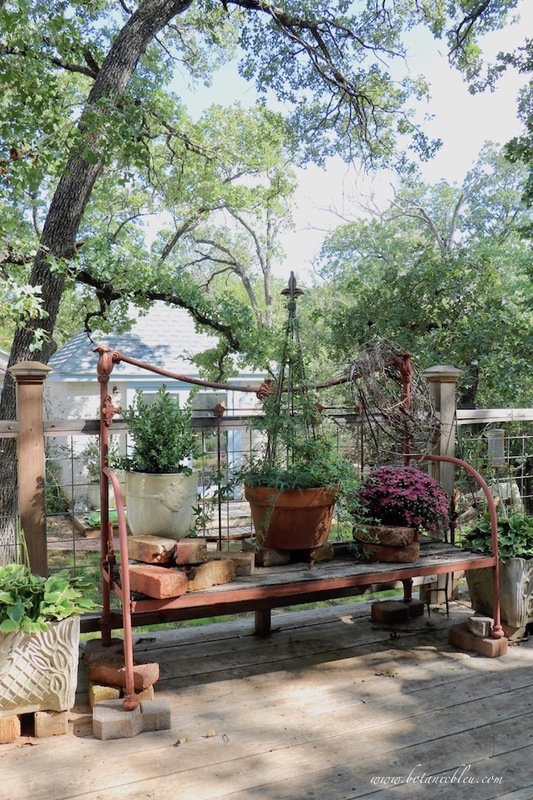 How do you give a vintage garden bench some French Country style? As with most good design, distinctive features that are iconic symbols provide unmistakable style. Used for centuries by French royalty in their castles, tapestries, furniture, architecture, and government papers, a fleur de lis is one of the most recognizable French designs. The repurposed bench has fleur de lis finials at each end that gives the bench French Country style regardless of what is placed on the bench. An ivy winds its way around a fleur de lis topped trellis with the same style fleur de lis as the finials on each end of the bench. 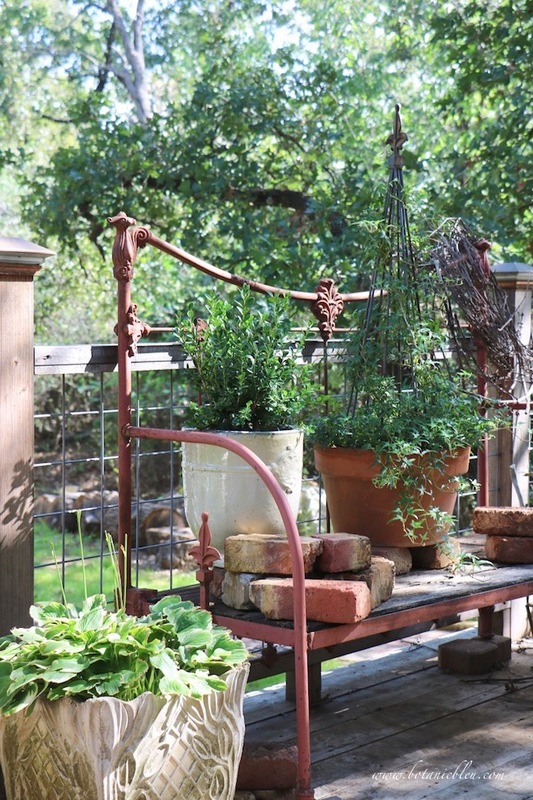 One of my brothers-in-law was an iron worker for many years, and he made this iron trellis for me several years ago. Using things handmade by family members is a French tradition that I love to follow. Footed urns with raised medallions can be found in most French country gardens. 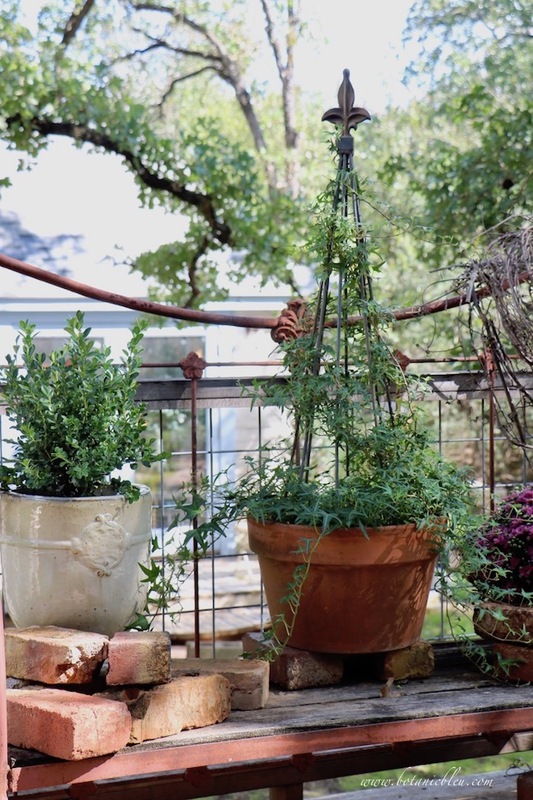 Early this year I was excited to find several large French style garden urns to add in several places in my gardens. Whenever I close my eyes and envision French gardens, I always see sculpted boxwoods. 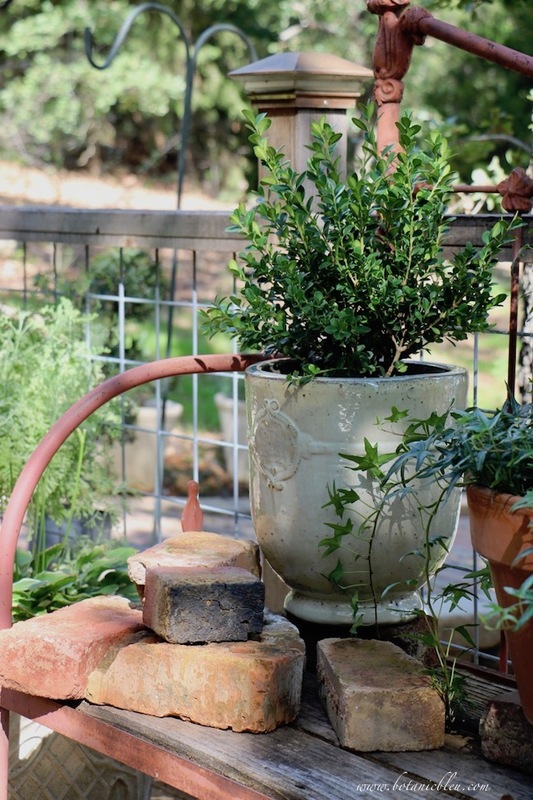 The small boxwood plant in the footed urn is almost big enough to be shaped into a ball. The vintage bricks are antique Chicago bricks found in a Classified Ad in the newspaper while we still lived in our former home. The ad was placed by an owner whose house had an antique Chicago brick exterior, and she had several left over. The bricks sat stacked along a fence in her country pasture. Over time sandy soil buried the bottom three or four stacks of bricks. The price was per brick and a bargain, but we had to remove the bricks ourselves. Which meant digging the last three or four layers out of the dirt. We used about half the bricks for an entry walkway at our former home, but saved the rest for the front walkway and porch in our new post and beam house. You can see the walkway and porch in the post about the Fall Entry Garden Curb Appeal. Repurposed materials are another French tradition. 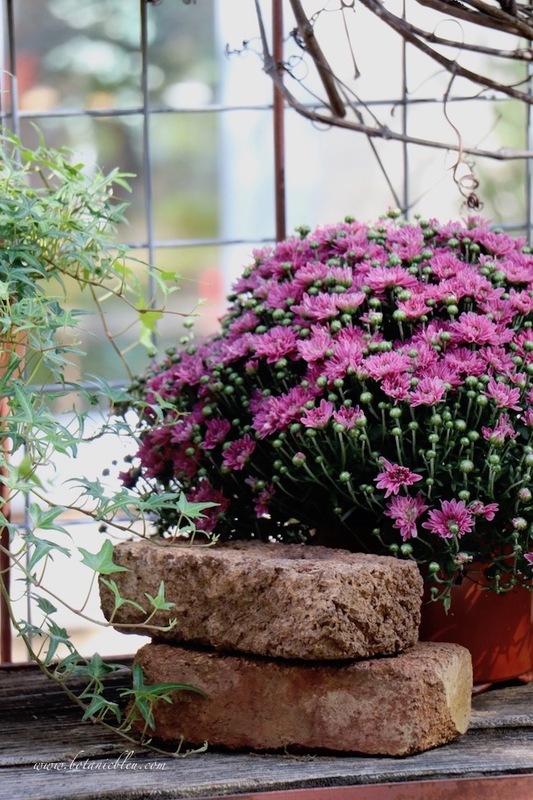 Left over bricks from my walkway and porch are used as risers for potted plants on the deck and bench in order for water to drain away. And for stacking on the bench because I like the way they look. 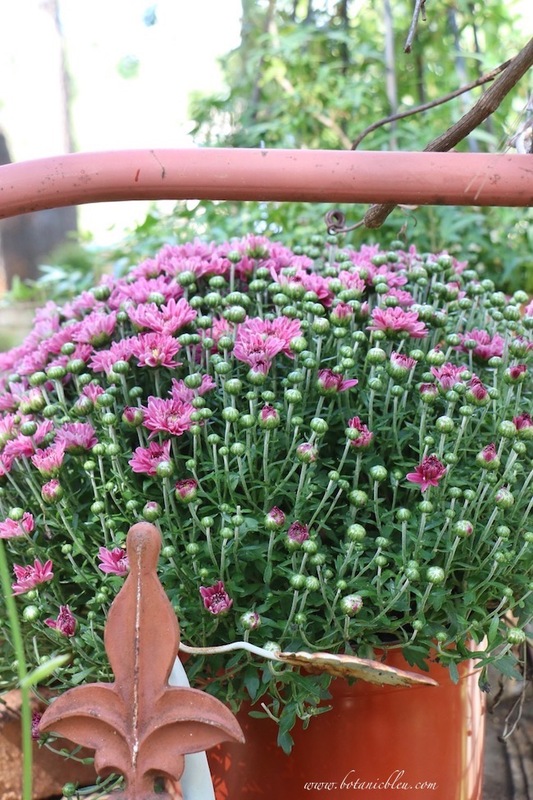 Purple mums and grapevine wreaths give a touch of Fall to the bench sitting on the open deck off the living room. You can see the newly emerged cool weather rye grass in the background. 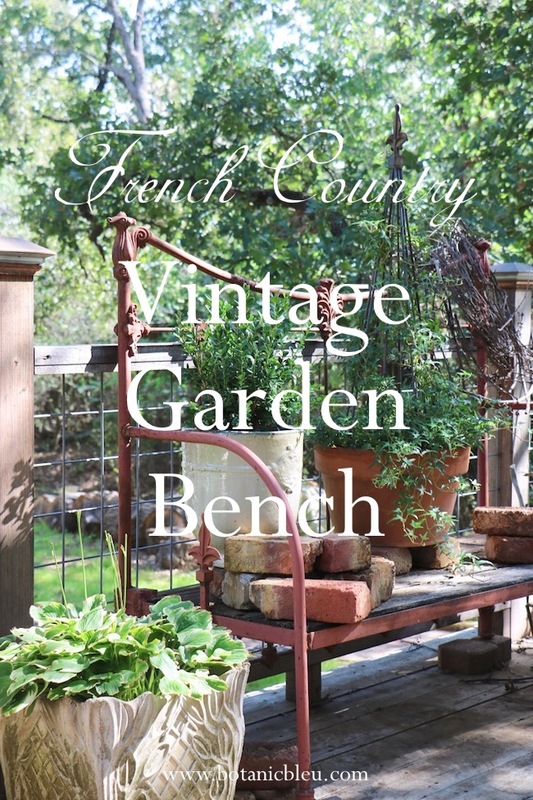 From a road trip to Forney, the bench made from a vintage iron bedstead was the beginning of a French country garden bench filled with memories and ever-changing plants for the seasons over the years. Whenever I look at the bench I remember the road trip and laughter with my best friend as we poked around barns filled with vintage and antique items. And I remember driving my husband's old beat-up standard-shift pick-up truck, bouncing along the highway happy with our new found treasures. 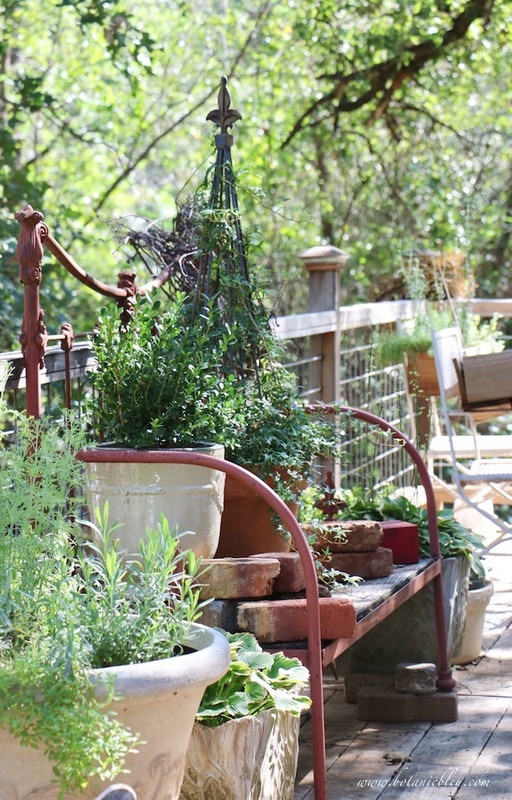 PIN ⥣ to your Gardening Pinterest board for future reference. I hit 1700+ followers this weekend. I hit 200+ followers this week. While my Pinterest and Instagram follower numbers are modest, I am thrilled that people enjoy what they see on those sites. I would love for you to follow on Pinterest and Instagram, and for you to invite your readers and followers to check out my sites. You can find the latest photo of my French Country Garden House on Instagram. Plus, I am posting a photo of French design each Friday as #frenchdesignfriday. And, I am finding new Pins for Christmas already. I love the Christmas season and have several Christmas boards! October is the best weather month in Texas! 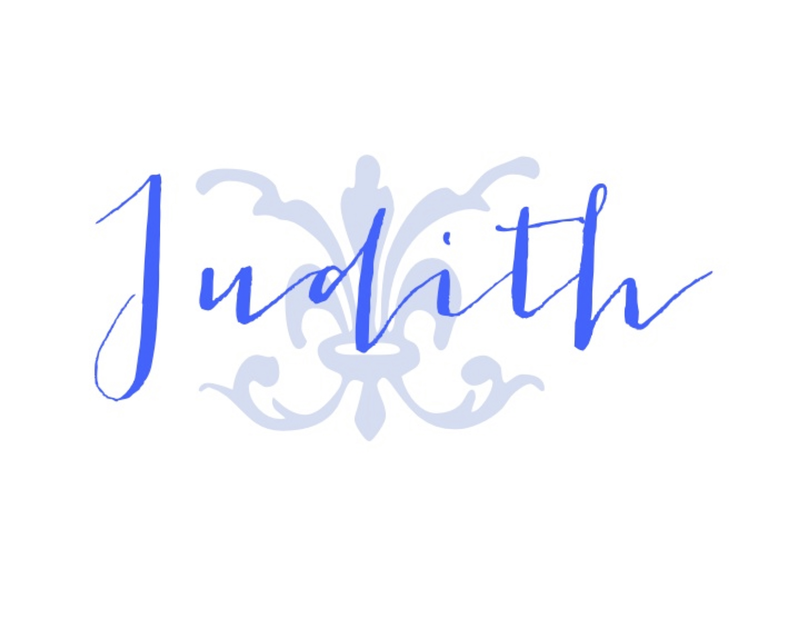 Judith, I love hearing about the way you so carefully chose everything for your home and still love most of it years later. My taste has changed over time but obviously, you've chosen the right things. Your bench is wonderful especially with the antique bricks and beautiful plants you've placed on it. Love that bench and your thought process in curating your home and accessories! Beautifully written post, Judith. I loved going to Forney. Two pieces in my sunroom came from Forney. I need to make a trip out there again some day. I love the bench and the bricks. Gorgeous. 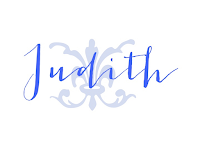 Judith, I loved reading this post. It made me smile thinking of all the little trips friends and I made to various Texas towns just to shop for antiques. The bench is a treasure! I admire your beautiful style, and the way you share your talents with all your readers.